This two-part case presentation describes the prosthetic challenge of managing complications after inadequate esthetic risk assessment, treatment planning, and implant positioning in the anterior maxilla. Here, the case report of a 50-year-old woman, referred after inappropriate execution of immediate implant placement, is presented. Different restorative treatment alternatives are proposed, excluding major surgical procedures. In the next part of the article, the advantages and shortcomings of the various prosthetic options will be discussed and the selected treatment revealed. The aim of this part of the article is to illustrate the importance of treatment planning, emphasizing that the correction of esthetic implant failures consistently leads to compromised results when compared to what could have been achieved first time round. Diagnostics are essential for predictable restorative dentistry. Both patient and clinician must agree on a treatment goal before the final restorations are delivered to avoid future disappointments. However, fully understanding the patient's desires is difficult. A useful tool to overcome this problem is the diagnostic wax-up and mock-up. A potential treatment outcome is modeled in wax prior to treatment and transferred into the patient's mouth using silicon indexes and autopolymerizing resin to obtain the patient's approval. Yet, this time-consuming procedure only produces a single version of the possible treatment outcome, which can be unsatisfactory for both the patient and the restorative team. Contemporary digital technologies may provide advantageous features to aid in this diagnostic treatment step. This article reviews opportunities digital technologies offer in the diagnostic phase, and presents clinical cases to illustrate the procedures. The second part of this article series presents an evidence-based update of clinical protocols and procedures for cavity preparation and restoration selection for bonded inlays and onlays. More than ever, tissue conservation dictates preparation concepts, even though some minimal dimensions still have to be considered for all restorative materials. In cases of severe bruxism or tooth fragilization, CAD/CAM composite resins or pressed CAD/CAM lithium disilicate glass ceramics are often recommended, although this choice relies mainly on scarce in vitro research as there is still a lack of medium- to long-term clinical evidence. The decision about whether or not to cover a cusp can only be made after a multifactorial analysis, which includes cavity dimensions and the resulting tooth biomechanical status, as well as occlusal and esthetic factors. The clinical impact of the modern treatment concepts that were outlined in the previous article - Dual Bonding (DB)/Immediate Dentin Sealing (IDS), Cavity Design Optimization (CDO), and Cervical Margins Relocation (CMR) - are described in detail in this article and discussed in light of existing clinical and scientific evidence for simpler, more predictable, and more durable results. Despite the wide choice of restorative materials (composite resin or ceramic) and techniques (classical or CAD/CAM), the cavity for an indirect restoration should meet five objective criteria before the impression. The loss of periodontal structure causes an esthetic problem for many patients, especially when the esthetic zone is compromised. Among the various types of solutions is the use of composite resins. While this procedure is not aggressive towards tooth structure, it does require the clinician to have a precise technique, and demands strict longterm maintenance. 1 Another way of treating the compromised teeth is with porcelain veneers. This procedure is especially difficult, however, if carried out on periodontal teeth, as it requires preparation along the roots. 2 The intention of the hybrid technique described in this article is to combine both of these procedures in order to obtain a less aggressive treatment with precise management of the soft tissue and an adequate esthetic outcome. The hybrid technique consists of enlarging the root portion of the teeth with composite resin to obtain a less aggressive tooth preparation, and thereafter placing porcelain veneers. When dealing with full-arch rehabilitation, the provisional phase is important in order to define the correct occlusal, intermaxillary, and esthetic relationships for each individual patient. In these cases, it is difficult to transfer this information to the final restorations. Several techniques have been developed to transfer the information from tooth- or implant-supported fixed provisionals to the definitive rehabilitations. The present article describes a technique proposed by the authors to transfer the information from a removable prosthesis to an implant-supported restoration. González, David / Cabello, Gustavo / Olmos, Gema / Niñoles, Carlos L.
Based on recent studies regarding the advantages of flapless immediate implants on the maintenance of the soft tissue architecture (especially at papillae level) in those situations where it is necessary to extract an anterior tooth, this case report describes a clinical procedure designed to replace a hopeless central incisor (2.1) showing root resorption adjacent to an implant-supported crown (1.1), whose gingival margin is 2 mm coronal regarding the hopeless tooth to be replaced. After the extraction of the hopeless tooth (2.1), a flapless immediate implant was placed. The implant-bone gap was then filled with bone substitute and a palatal connective tissue graft was placed ad modum saddle extending at buccal level from apical to the mucogingival line, sealing the socket and extending until 6 mm at palatal level ad modum saddle. This procedure allowed symmetry of the soft tissue margins between the two implants (1.1 and 2.1) to be obtained as well as the preservation of the inter-implant papillae (1.1). Reino, Danilo M. / Maia, Luciana P. / Novaes jr., Arthur B. / Souza, Sérgio L. S.
Reduced root coverage due to diminished periodontal vascularity can be expected in heavy smokers. The aim of this study was to evaluate the root coverage obtained for large gingival recessions in heavy smokers using two different surgical techniques. Twenty heavy smokers were selected. Each patient had large, bilateral Miller class I or II gingival recessions (Control Group (CG): 3.30 ± 1.29; Test Group (TG): 3.45 ± 0.80) on nonmolar teeth. Clinical measurements of probing pocket depth (PPD), clinical attachment level (CAL), recession height (RH), keratinized mucosa height (KMH), and keratinized mucosa thickness (KMT) were determined at baseline and after 12 months. One side received a coronally positioned flap (CPF), while the contralateral side received the extended flap technique (EFT), both procedures carried out in conjunction with a subepithelial connective tissue graft (SCTG). Saliva samples to measure cotinine levels were taken at baseline and after 12 months as an indicator of the level of exposure to nicotine. Intergroup and intragroup analysis showed no statistical differences for the evaluated clinical parameters. Patients maintained the same exposure to smoke during the evaluation period. Both techniques resulted in low root coverage (CPF: 48.60%; EFT: 54.28%), but both techniques were effective in decreasing the gingival recessions (P ≤ 0.01). The variables smoke exposure, root coverage, and the thickness and height of keratinized tissue were subjected to linear regression. Regardless of the surgical technique used, heavy smoking strongly limits root coverage, especially for large recessions. Objective: This study assessed the wear behavior of different zirconia substrates with distinct surface roughness against different antagonist materials. Method: Hemisphere-shaped specimens (diameter 5 mm) made out of different materials (VM9, Vintage ZR, IPS e.max Press, and human enamel) were used as antagonists against plates of three zirconia materials (P-NANOZr, Cercon HT, and Zenostar) with different surface roughness (smooth [Ra = 0.01], moderate [Ra = 0.1], and rough [Ra = 1]). Each group (n = 7) was exposed to thermomechanical fatigue in a mastication simulator to simulate 5 years of clinical service. All specimens were scanned using a laser scanner and volumetric loss was quantified. Scanning electron microscopy was used to evaluate wear pattern, while Raman spectroscopy was employed to determine the crystalline property of zirconia specimens. Results: For zirconia, the smallest volumetric loss was recorded with smooth P-NANOZR against enamel antagonists (0.002 ± 0.002 mm3), whereas the greatest loss was observed with rough Cercon HT against Vintage antagonists (0.37 ± 0.14 mm3). For antagonists, smooth Zenostar against enamel antagonists yielded the smallest volumetric loss (0.03 ± 0.02 mm3), whereas the greatest loss values were recorded with rough Zenostar against VM9 antagonists (2.67 ± 0.35 mm3). A positive correlation was found between surface roughness of zirconia specimens and volume loss of base and antagonist specimens. PNANOZR showed less wear compared to other zirconia materials. The wear pattern was comparable among different specimens. Artificial aging did not influence the levels of tetragonal and monoclinic phases of different zirconia materials. Conclusion: While microstructure shows a relatively smaller effect, surface roughness of zirconia has the greatest effect on its wear and on the wear of antagonists. Aim: One of the most challenging tasks in daily practice when it comes to defining treatment goals and how to attain them is the communication with the patient and the self-reflection of the treating dentist. Failures due to miscommunication are common, especially in esthetic dentistry. The purpose of this study was to evaluate the influence of dental education on students' and dentists' judgment of patients' dental appearance. 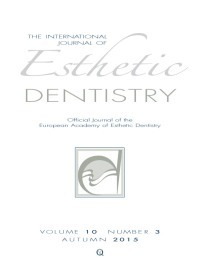 Materials and methods: Based on internationally accepted guidelines about dental esthetics, a questionnaire was developed to measure "dental appearance" (QDA). Eleven items defined a QDA score (0 = "absolutely dissatisfied", 100 = "absolutely satisfied"). The QDA was completed by 29 patients (21 women, 8 men) before and after a complete oral rehabilitation, including restoration of the anterior teeth. Overall, 95 students (1st, 5th, and 10th Semester) and 30 dentists evaluated the patients' esthetics before and after rehabilitation on a visual analog scale (VAS; 0 = "absolutely unesthetic", 100 = "absolutely esthetic"). Results: Students and dentists alike judged a significant esthetic improvement after treatment (P ≤ 0.0001). Significant differences could be found when comparing the students' and dentists' judgment and the patients' self-evaluation (P ≤ 0.05). Conclusion: Since it seems that students judge dental appearance differently from patients' self-assessment, teaching esthetic rules at university should incorporate the aspect of patient feedback in order to avoid misconceptions.